It is often said that parenting is the toughest job in the world and it is very well so. This also stands true in Disney’s new movie “Descendants” where some of Disney’s favorite villains (Maleficent, Evil Queen, Cruella de Vill and Jafar) prepare their kids in the Isle of the Lost to take over Auradon with their evil ruling. Their kids are allowed to study college in Auradon but their main focus is to help Maleficent by stealing Fairy Godmother’s magic wand. Even though there is a saying that the apple doesn’t fall far from the tree, this apple might very well be sweet on the inside. Maleficent’s daughter Mal is a perfect example of that! Her mom’s dream to help her rule over and destroy might be challenged by her daughter’s sweet side. Mal falls deeply in love with Beauty and the Beast’s son Prince Ben from Auradon who shows her that everyone has a choice to make in life. 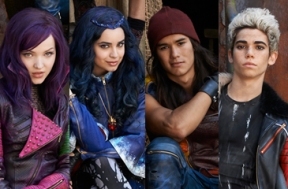 If you thought that you have seen it all and that Disney can’t surprise you with something new, “Descendants” will challenge that view. It is by far one of the most creative and interesting twists of the fairy tales we have seen so far and it’s worth to be seen by all parents and children alike. 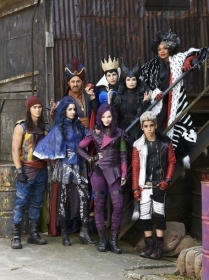 Dove Cameron, Cameron Boyce, Booboo Stewart and Sofia Carson star as the teenage sons and daughters of Disney’s most infamous villains, in Disney’s “Descendants,” a live-action movie that – with a knowing wink at traditional fairy tales –fuses castles with classrooms to create a contemporary, music-driven story about the challenges in living up to parental and peer expectations. Made for kids, tweens and families, the movie is directed, executive-produced and choreographed by Emmy Award-winning Kenny Ortega. View trailer: https://www.youtube.com/watch?v=yJCphjtVek0.